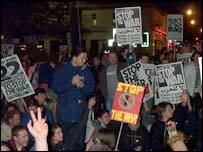 Anti-war demonstrations have been taking place across the south, as military action intensifies in the Gulf. Lunchtime saw protests at Southampton University and in Dorchester, and there were larger protests in Portsmouth and Southampton on Thursday evening. Between 300 and 500 protesters gathered outside the Civic Centre in Southampton, bringing traffic to a standstill. A similar number stood on the steps of Portsmouth town hall. They then made their way through the city and onto the M27, forcing its temporary closure. 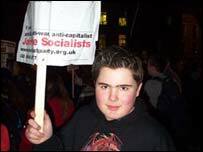 Arwyn Palmer, aged 12, was at the evening protest in Southampton with his parents. "Lots of people died on September 11 - how many more people have to die?" "I just don't know why they have to attack Iraq - they say Iraq has weapons of mass destruction, but all Bush and Blair are doing is using weapons of mass destruction themselves," he said. Brenda Morris said it was the only way she could think of registering her anti-war feelings. She said she was unhappy about the decision to block the traffic. "It's not something I'd choose to do myself - but I'm happy to go along with it if everyone else is doing it." Earlier on Thursday, several hundred students walked out of lectures and protested on the Southampton University campus.